Introspection at a water pond of Vaitheeswaran Koil temple in Tamil Nadu. The temple is dedicated to Lord Shiva. Searchable map and satellite view of the Indian state of Tamil Nadu. The state was known as Madras until 1968. Tamil Nadu occupies the southeastern part of the Indian subcontinent and is bounded by the Bay of Bengal in the east, the Palk Strait and Palk Bay in the southeast, the Gulf of Mannar and the Laccadive Sea in the south. Tamil Nadu borders Kerala in the west, Karnataka in north-west, Andhra Pradesh in the north, it surrounds the enclave of Pondicherry, part of Puducherry, a former French India colony, and now one of India's Union Territories. Tamil Nadu covers an area of 130,060 km² (50,216 sq mi), compared it is slightly smaller than Greece, or somewhat larger than the US state of Mississippi. The east of the state is dominated by the Coromandel Coast, the southeastern coastal region of the Indian subcontinent. Doddabetta, a mountain in the Nilgiri Hills (Western Ghats) in the northwest, is the highest point in Tamil Nadu at 2,637 m (8,652 ft). The 8th century Shore Temple at the Bay of Bengal near Mamallapuram, Tamil Nadu. One of India's oldest structural temples is today a UNESCO World Heritage Site. Largest city and capital of Tamil Nadu is Chennai (formerly known as Madras), a seaport on the Coromandel Coast. Other major cities are Coimbatore (Kovai), on the banks of the Noyyal River, east of the fringes of the Western Ghats, the city is known as the "Manchester of South India" due to its cotton textile industry. Madurai on the banks of Vaigai River, famous for its 14 colorful gopurams (gateway towers) of the Meenakshi Amman Temple, Madurai is one of the 100 Indian cities to be developed as a smart city. Tiruchirappalli in the geographic center of the state is an important educational center in Tamil Nadu and home to the Indian Institute of Management (IIMT), the Indian Institute of Information Technology (IIIT) and the National Institute of Technology (NITT). Tiruppur, a major center of the textile and knitwear industry, contributing to 90% of total cotton knitwear exports from India. Tamil Nadu is inhabited by a largely Tamil-speaking Hindu population. Total population of Tamil Nadu: 78 million people (est. 2017). Agriculture is the major occupation in Tamil Nadu. The principal food crops include paddy, millets and pulses. 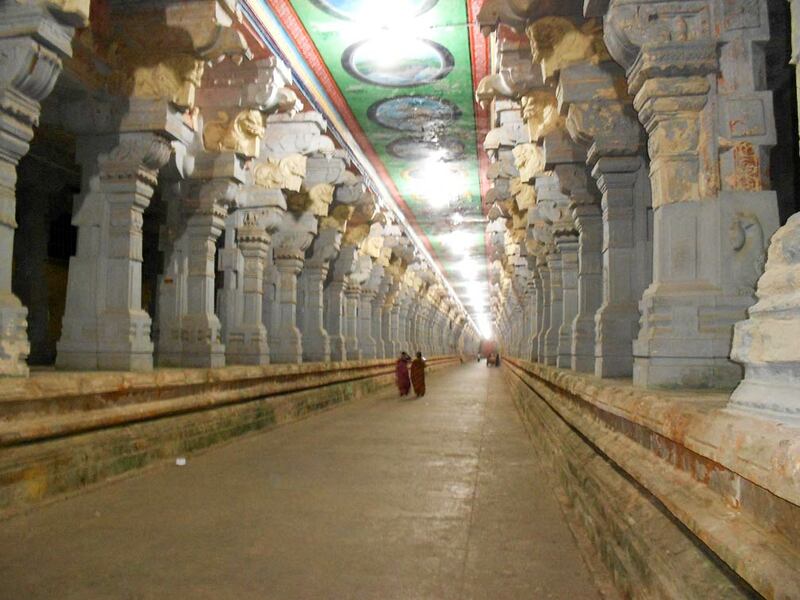 Ramanathaswamy Temple, the 1000 pillars of the Great Corridor, Rameswaram island. The primary deity of the temple is Ramanathaswamy (Shiva) in the form of lingam, a representation of Shiva dating back to the Indus Valley Civilization. Mudumalai National Park, wildlife sanctuary and tiger reserve in the shadow of the Nilgiri Hills. Brihadisvara Temple, 11th century Hindu temple complex dedicated to Shiva located in Thanjavur. 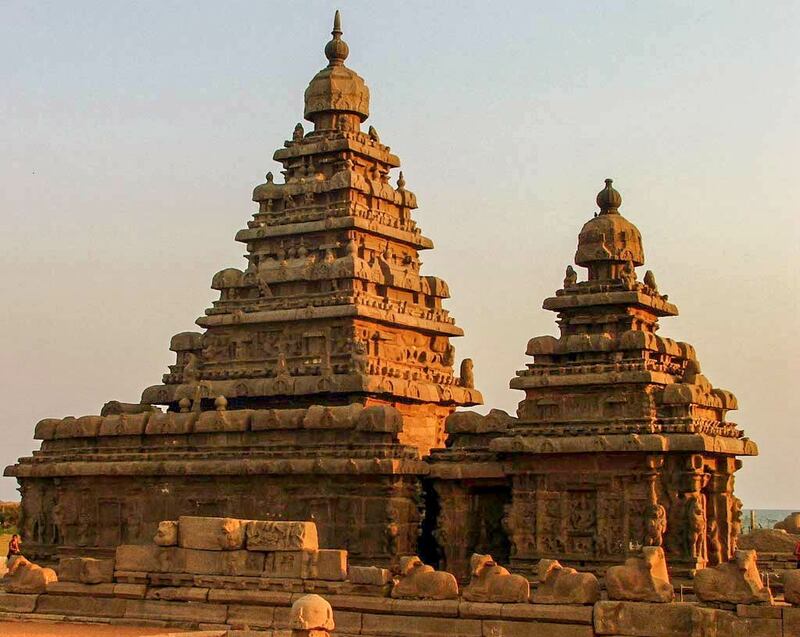 The Great Living Chola Temples are a UNESCO World Heritage Site. Meenakshi Amman Temple, ancient walled Hindu temple on the southern bank of the Vaigai River, has a sacred water pond and colorful, sculpted gate towers. Ramanathaswamy Temple (Rameswaram), one of the holiest temples in Hindu religion and one of the twelve traditional Jyotirlinga shrines in India, a site of pilgrimage with several shrines located on Rameswaram island (also known as Pamban Island), a small island between peninsular India and Sri Lanka. Nilgiri Mountain Railway, a steam locomotive rack railway, built by the British in 1908, that runs on a daily basis between Mettupalayam and Udhagamandalam. The Mountain Railways of India are a Unesco World Heritage Site. The map shows Tamil Nadu state with cities, towns, expressways, main roads and streets, and the location of Chennai International Airport (IATA code: MAA) in a distance of 7 km (4.3 mi) south west of Chennai. Major ports in the State are Chennai and Tuticorin. Google Map: Searchable map and satellite view of Tamil Nadu, India. Satellite view of the famous mausoleum. Wikipedia entry for Tamil Nadu.